[147 Pages Report] The data center cooling market size is estimated to grow from USD 7.12 Billion in 2016 to USD 14.28 Billion by 2021, at a Compound Annual Growth Rate (CAGR) of 14.95%. The market is driven by factors such as the growing need to improve processing capabilities, reduce the heat generated by increased data center power densities, and focus on developing cost effective and green data centers solutions. In this study, 2015 has been considered as the base year and 2016-2021 as the forecast period. Data centers have radically grown in terms of number and performance in the past few years. Moreover, data center power densities have increased to an average of up to 1.5 kW per rack causing an increase in the heat generated. The rising rack power densities are limited by air distribution within the data center as IT equipment typically requires between 100 and 160 cfm of air per kW. Air flows within the data centers are limited by the cap in ceiling height, which further limits the height of the raised floors required for effective cooling. This limit to the air flow caused by constraint to the height of the raised floor further puts a cap on the average and peak power densities within the data centers. These data centers require additional air conditioning and distribution equipment to exceed their rack density, causing a further increase in the demand for data center cooling solutions across various industrial verticals. In September 2016, Airedale launched the Ecotel, which is an energy efficient cabin cooling solution for telecom cabins, switchgear, and equipment rooms. In September 2016, Rittal and IBM announced an extension to its existing collaboration by extending their coverage on a global scale, which was previously applied for the EMEA region only. 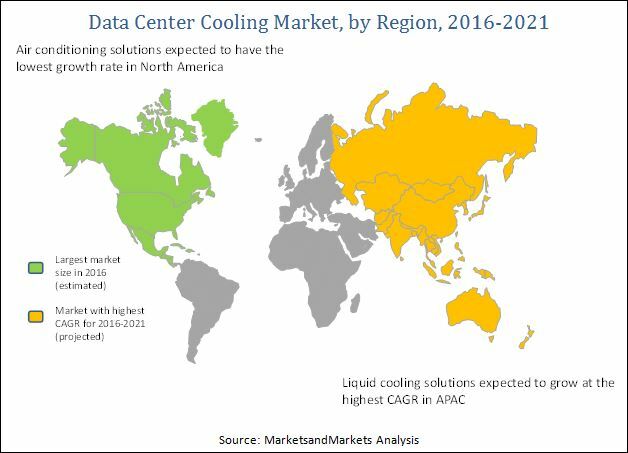 The main objective of this report is to define, describe, and forecast the global data center cooling market on the basis of solutions, services, types of cooling, data center types, industries, and regions. The report provides detailed information regarding the major factors influencing the growth of the market (drivers, restraints, opportunities, and industry-specific challenges). The report aims to strategically analyze micromarkets with respect to individual growth trends, future prospects, and contributions to the total market. The report attempts to forecast the market size with respect to five main regions, namely, North America, Europe, Asia-Pacific (APAC), Middle East & Africa (MEA), and Latin America. The report strategically profiles key players and comprehensively analyzes their core competencies. This report also tracks and analyzes competitive developments such as joint ventures, mergers & acquisitions, new product developments, and research & development activities in the data center cooling market. The data center cooling ecosystem comprises vendors, such as, Schneider Electric SE (France), Black Box Corporation (U.S.), Nortek Air Solutions, LLC (U.S.), Airedale International Air Conditioning Ltd. (U.K.), Rittal GmbH & Co. KG (Germany), STULZ GmbH (Germany), Vertiv Co. (U.S.), Asetek (Denmark), AdaptivCOOL (U.S.), and Coolcentric (U.S.); service providers, system integrators, and enterprises. "Study answers several questions for the stakeholders, primarily which market segments will focus in next two to five years for prioritizing the efforts and investments". The data center cooling market is estimated to grow from USD 7.12 Billion in 2016 to USD 14.28 Billion by 2021, at a high Compound Annual Growth Rate (CAGR) of 14.95% during the forecast period. 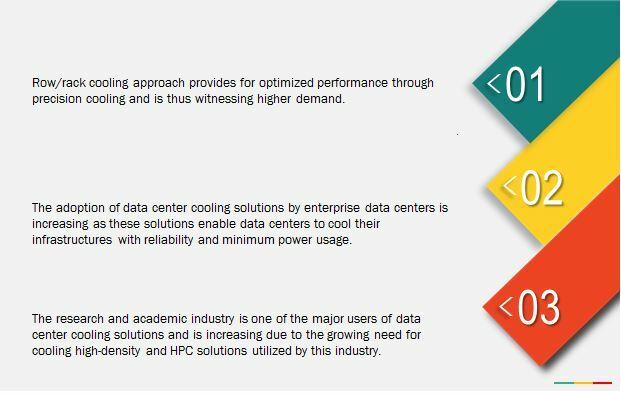 Data center cooling solutions are witnessing an increasing demand due to the various benefits for effective heat removal provided by these solutions. Additionally, data center cooling solutions are becoming more environment-friendly and energy-efficient, requiring less operational costs. Organizations are rapidly adopting these advanced cooling systems to overcome the shortcomings associated with traditional cooling systems for data centers, which has resulted in the increased adoption of these solutions across major industry verticals. The report provides detailed insights into the global data center cooling market, which is segmented by solution, service, type of cooling, data center type, industry, and region. In the segment of solutions, air conditioning holds the largest market share as it facilitates precision cooling with directed air flow for efficient cooling; whereas, the liquid cooling solutions segment is expected to show great growth opportunities and grow at the highest CAGR. Data center liquid cooling solutions enable low costs and reliable cooling for a variety of data center needs. This technology has become popular among enterprises and is expected to decide the future of data centers. In terms of services, the installation and deployment services segment is expected to dominate the data center cooling market and contribute the largest market share; whereas, the maintenance and support services segment is set to grow at the highest CAGR during the forecast period. Growing investments in data center cooling across the world and the increasing adoption of these solutions are further fueling the growth of the data center cooling market. BFSI is a sector characterized by digitization and an increasing number of customers using various banking applications. This has resulted in the exponential growth of data in the banking and financial services industry. Data is considered the most crucial part of such organizations and consequently, there are many regulations regarding data storage and protection. The data centers in BFSI are characterized by larger server densities that generate high amounts of heat and require powerful cooling infrastructure. Moreover, with the increasing budget constraints, cost-effective infrastructure solutions are becoming essential in the BFSI industry. Thus, this industry focuses on lowering the energy consumption by installing advanced data center cooling and innovative building management tools. The IT and telecom industry is increasingly adopting advanced technologies such as blade servers in order to cater to the growing computational requirements. However, these solutions are not only incredibly energy-hungry, but also are more difficult to cool. This increases the energy requirement of the data centers as well as the operating temperature, thus rendering them unstable to run. Moreover, the growing number of users is driving the demand for efficient and secure data centers across this industry. Data center cooling solutions help in providing efficient cooling for the high-density data centers that are deployed within organizations in the IT and telecom sector. This is expected to increase the demand for data center cooling solutions in the IT and telecom industry. Efficient data center operations for the academic sector improves learning environment, foster greater collaboration, and facilitates administrative services. Thus, eruptional institutes are increasingly storing their data in the digital form. Moreover, research and academic institutes requires HPC devices such as supercomputers, which are characterized by high-compute density. Thus, this industry is increasingly replacing its traditional data centers with advanced data centers that operate with high energy efficiency and reduce the environmental impact by installing solutions that focus on energy-efficiency and carbon reduction. Such institutes have started deploying innovative cooling solutions such as CRAH, cold-door cooling, aisle, and rack cooling units. This has resulted in an increasing demand for deploying data center cooling solutions in the research and academic industry. What are the upcoming industry applications for data center cooling? The report covers all the major aspects of the data center cooling market and provides an in-depth analysis across the regions of North America, Europe, Asia-Pacific (APAC), Middle East & Africa (MEA), and Latin America. The market in North America is expected to hold the largest share of the market. The APAC region is projected to have great opportunities in this market and would grow at the highest CAGR by 2021, due to the presence of various developing countries, growing number of data centers, and an increasing adoption of data center cooling technology. However, high investment costs may act as the restraining factor for the market. Various vendors are coming up with innovative data center cooling solutions and products due to the emerging demand for efficient, cost-effective, and eco-friendly. Nortek Air Solutions provides data center cooling solutions & services, and has decades of experience in data center cooling and related infrastructure offerings. It has also adopted strategies such as new product launches and acquisitions in this market. The other major vendors providing cooling data center solutions and services are Schneider Electric SE (France), Black Box Corporation (U.S.), Airedale International Air Conditioning Ltd. (U.K.), Rittal GmbH & Co. KG (Germany), STULZ GmbH (Germany), Vertiv Co. (U.S.), Asetek (Denmark), AdaptivCOOL (U.S.), and Coolcentric (U.S.). These players adopted various strategies such as new product launches, partnerships, collaborations, and acquisitions to become competitive in the data center cooling market. 15.5 Airedale International Air Conditioning Ltd.
16.1 Integrated Eco Technologies Ltd.
16.4 Liquid Cool Solutions, Inc.